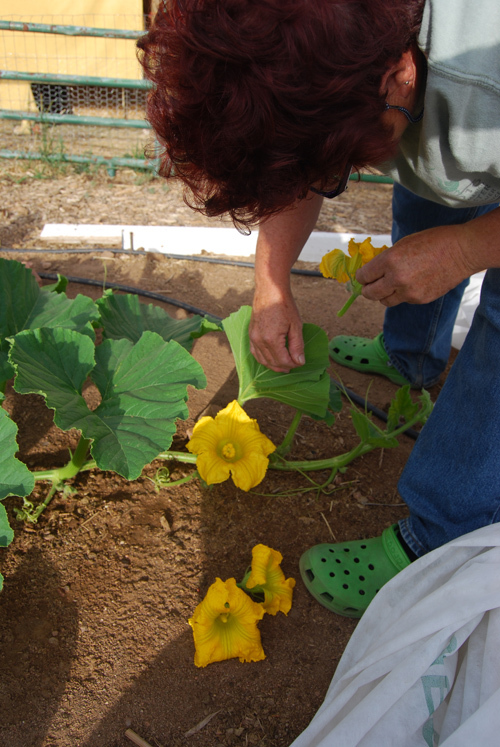 Here I’m getting ready to pollinate a giant pumpkin. I’ve gathered several male flowers that are by my shoe. I have one in my hand ready. I try to use several male flowers to make sure I get enough pollen on the female flower. Notice the female flower just below my hand that is open and ready to be pollinated. Here is a closeup of the male flower. The ants can be accidental pollinators too. 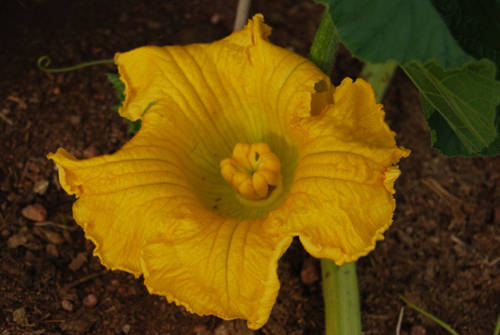 Here is a closeup of the female flower. When she opens up first thing in the morning, she is ready to receive pollen. Here I’m peeling off the flower petals from one of the male flowers. I peel off the petals so only the stamen is left. That way it can get to the female stigma. Here is the male flower with all the petals off. Notice the pollen on the stamen and around the base. Now I take the male stamen that is loaded with pollen and use it like a paintbrush to paint the pollen all over the female stigma. then I repeat with the extra male flowers. 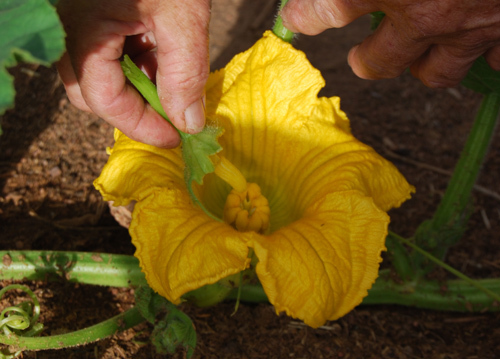 Then I tie and close up the female flower so it can’t accidentally get pollinated by the beez. It will stay closed up for one day and then I will untie it as the female blossom will only acept the male pollen for about a 4 hour period. If you want to know who are the parent pumpkins, this is the way to control the assurance of the genetics. 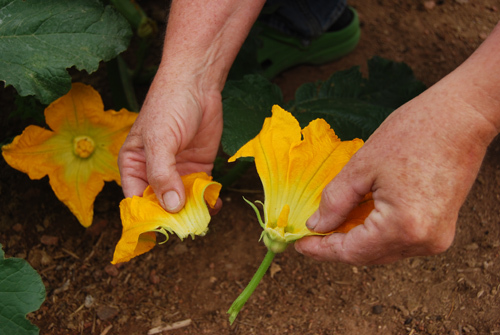 We try to get bigger and better pumpkins each year which is why we hand pollinate. Paul Robeson-black tomato-YES-A Farmers Market favorite although I prefer others. Cherokee Purple-purple tomato-NO-I missed this one last year but it is wonderful. As good as Brandywine. Cherokee Chocolate–YES-Just as good as Cherokee purple but a little brownish color. I will choose between one of the Cherokees due to space. Prudens Purple-purple tomato-NO-not as good as the Cherokees nor as prolific but planted it because it was suppose to ripen sooner-not true for me last year. Black Krim-black tomato-NO I didn’t do this one last year but had it in the lineup because it is only 69 days to ripen. Never had good luck in previous years. Sun Sugar-yellow cherry-NO-kinda like a lot of yellow cherry tomatoes but super sweet.Want to try something different. Big Zac-red/80 days-YES-takes the longest to ripen but taste is great and chance to grow a huge one. 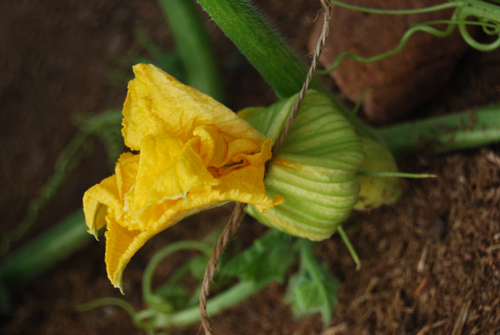 SUMMER SQUASH-ZUCCHINI-Costata Romanesco –YES wonderful taste and Lungo Bianco-NO-it was good and more prolific than Romanesco but not as flavorful. Sticking to one kind this year. 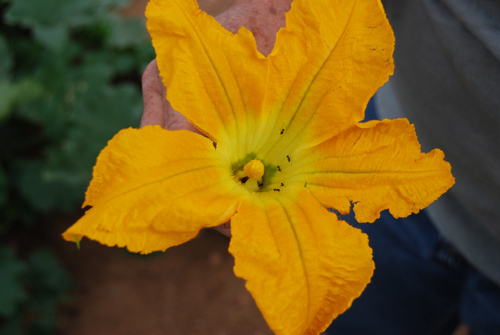 WINTER SQUASH-Marina di Chioggia–NO-powdery mildew problem and not many squashes and Galeux d’Eyesines–YES-prolific-great taste-3rd yr.
EGGPLANT-Little Fairy-YES-prolific tender skin and great taste, third year in a row. 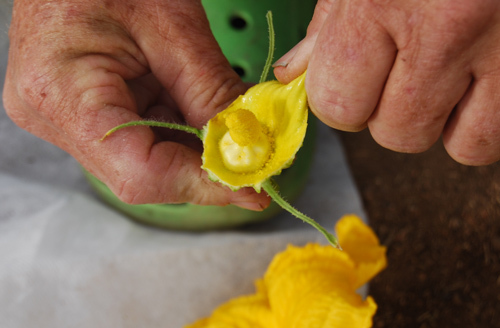 Thai Yellow Egg–NO-took all season to develop and then froze at first frost. What a disappointment. SPINACH-from COOK’S GARDEN-Indian Summer and Double Choice-NO-will look for bigger leaf variety.Too puny. CARROTS-from COOK’S GARDEN-Kaleidoscope (mix of red, purple, orange and yellow)-NO want only orange and purple ones this year. BROCCOLI-Brocolli Romanesco-NO–takes too long to develop. KONG BREAKS NEW MEXICO STATE RECORD!!!!!!!!!!! Kong broke the New Mexico State Giant Pumpkin Record today coming in at 421 lbs beating the old record of 404 lbs! The record comes home to Santa Fe which is quite a feat considering our high altitude and short growing season. Kong also got a ribbon for third place in the weigh-off for 3rd biggest pumpkin out of about 25 contestants and $100 (yea-paid for my gas to get up there!). The first place was a 1109 lb monster pumpkin grown by a Colorado grower named Marc Sawtelle and second place was over 800 lbs grown by another Colorado grower named Doug Minix. These guys are my heros-they are really nice and share information about growing these monsters. My pumpkin was little by comparison but still bigger than all the rest of them. My giant marrow, ‘Big Zuc’, also got a ribbon for Best Squash and also set a new New Mexico record. What a way to finish the gardening year. Couldn’t be better!! Got up at 4:30 am and left by 6am to get up to Colorado Springs by 10:30am. We unloaded Kong at 10:30 and waited till weigh-off time at noon. We met the mayor of Colorado Springs who told us the sorid story of the city when it was a mining town and one side of the main street (that we were on) was for the brothels and other side was the respectable side. He told us the story of how the men would drop off their wives at the opera on the respectable side, go into some tunnels to cross the street over to the brothels and come back again to pick up their wives after the opera! Hmm! He looked like the guy in Monopoly (I think the banker?) I also met Buffalo Bill Cody (I think reincarnated)! Lots of people and families came. At noon when they went to turn the digital scale on they couldn’t get it to work! Arg! I was freaking out inside as I really wanted Kong weighed and didn’t want to go all the way home without doing that. Talk about how anticlimactic that would of been! Anyways they worked on it for about 40 minutes while I’m dying inside and finally they got it fixed. Phew! Talk about a freak out! Where were the ‘tums’? Then they started weighing them from smallest to largest. The next thing that made me worried was the entry right before me was a beautiful orange color and looked bigger to me, but only weighed in at 375 lbs. Sheez! Did I measure wrong? Marc and Doug(the two biggest growers there) told me later that color (as in bright orange) always weighs lighter than the salmon color pumpkins. Then the big moment..and Kong weighed in at 421 lbs. Elodie and I were screaming and yelling as they announced I broke the NM State Record! Such a thrill! 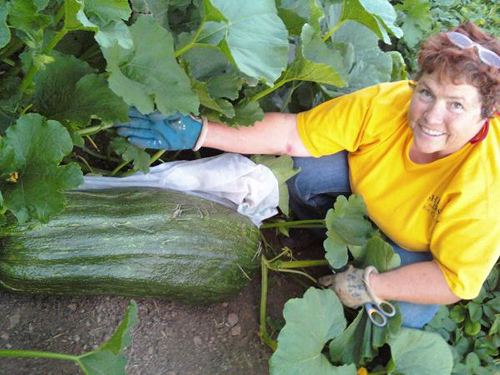 Then they put my giant marrow, ‘Big Zuc’ (think zuccini) on the scale and it weighed 43 lbs. Biggest fricking zucchini I ever grew! Also a NM State Record! Icing on the cake! So I got ribbons for third place for Kong and Best Squash for ‘Big Zuc’ and of course the sweetest was breaking the NM State pumpkin record. What a way to end the giant pumpkin season! Here is a slide show of the weigh-off.